King Salman has sacked an official from the ministry of commerce who attended in capital Riyadh a fashion show, decried by the kingdom’s top clerics. The royal decree issued on Sunday targeted Ghassan al-Sulaiman, a senior advisor in the Ministry of Commerce. 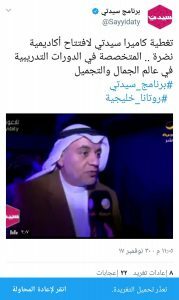 Al-Sulaiman drew public ire after attending last week a fashion show organized in the Saudi capital. A video of the models dressed in black robes without headscarves, walking on the catwalk went viral on social media causing wide spread condemnations. In an interview at the event organized by a beauty academy, al- Sulaiman, who heads the General Authority for Small and Medium Enterprises, praised the “beauty” of the show. Succumbing to condemnations, the ministry’s official on Twitter condemned the show indicating that it does not represent Saudi Arabia’s Islamic tradition. Sulaiman added that the ministry was not aware the event was to take place. The kingdom is known for its harsh implementation of Islam unlike other Gulf countries, which are opened to western culture. However as the country faces budget deficit and the collapse of oil revenues, the ambitious Crown Prince, Mohamed bin Salman who is driving reforms, has embarked the home of Islam on a more moderate path. The kingdom allowed for the first time women in a stadium in October. They can enter on regular basis from next year. Women can also start driving as of June next year. The reforms are likely to pave way to musical concerts and lift of the ban on cinema. Written by: KanelkaTagba on December 5, 2017. Posted by KanelkaTagba on Dec 5 2017. Filed under Gulf News, Headlines. You can follow any responses to this entry through the RSS 2.0. Both comments and pings are currently closed.